A very busy 2018 ended for Mountain Rescue in Wicklow with a very quiet Christmas period and the first two callouts of 2019 were this weekend. Both were lower leg injuries in the Glendalough area, which were difficult to access due to sever traffic congestion and parking in the area. At 15:39hrs on Saturday 05th January 2019, The Glen of Imaal Mountain Rescue Team and Dublin Wicklow Mountain Rescue Team were tasked by An Garda Síochána to assist a hill walker on the Blue Trail in Glendalough. The woman had fallen and sustained a lower leg injury. Mountain Rescue (MR) personnel were dispatched and they assessed and treated the woman’s injury. She was assisted to an MR vehicle and transported to a waiting HSE ambulance. The incident was stood down at 16:22hrs. At 12:04 on Sunday 6th January 2019, The Glen of Imaal Mountain Rescue Team and Dublin Wicklow Mountain Rescue Team were tasked by An Garda Síochána to assist a hill walker in the Glendalough area. The woman was walking on the Spink when she fell and sustained a lower leg injury. MR parties were dispatched. The casualty’s injuries were assessed and treated by an MR medic and she was stretchered to a waiting ambulance. The incident was stood down at 14:24hrs. We would like to thank the HSE National Ambulance Service (NAS) for their assistance on both callouts. At 14:56 on Saturday, November 10th, The Glen of Imaal Mountain Rescue Team and Dublin & Wicklow Mountain Rescue Team were tasked to assist a mountain biker in the Glencullen Adventure Park. Mountain rescue (MR) assistance was requested when a mountain biker briefly lost consciousness after a fall and then experienced neck pain. MR personnel responded to the incident site and the biker was assessed by an MR doctor. The mountain biker was stretchered a short distance and transferred into an ambulance. The incident was stood down at 16:00. We’d like to thank the National Ambulance Service (NAS) for their assistance. At 14:06hrs on Sunday 11th November 2018, The Glen of Imaal Mountain Rescue Team and Dublin & Wicklow Mountain Rescue Team were tasked by An Garda Síochána to assist a man in the Glendalough area. At 11:33 on Saturday, December 1st, The Glen of Imaal Mountain Rescue Team and Dublin & Wicklow Mountain Rescue Team were tasked by An Garda Síochána to assist at an incident in the Glen of the Downs. Mountain rescue (MR) assistance was requested by the National Ambulance Service (NAS) to assist with the evacuation of a patient who had suffered a seizure. MR responded to the scene to assist NAS personnel. Following assessment, it was decided to evacuate the patient on foot to a waiting ambulance. The incident was stood down at 12:29. We’d like to thank the National Ambulance Service (NAS) for their assistance. At 16:15 on Sunday, The Glen of Imaal Mountain Rescue Team and Dublin & Wicklow Mountain Rescue Team were tasked by An Garda Síochána to assist at an incident in Ravensdale Forest, Co Louth. Mountain rescue (MR) assistance was requested when a conservation worker fell from a tree while inspecting feed boxes. Due to the location of the incident, it was decided to request assistance from Mourne Mountain Rescue Team. The patient was assessed and treated by an MR advanced paramedic and then stretchered to a waiting ambulance. The incident was stood down at 19:58. We’d like to thank Mourne Mountain Rescue Team and the National Ambulance Service (NAS) for their assistance. At 15:33 on Tuesday, December 4th, The Glen of Imaal Mountain Rescue Team and Dublin & Wicklow Mountain Rescue Team were tasked by An Garda Síochána to assist a walker near the Sally Gap. Mountain rescue (MR) assistance was requested when a walker fell and sustained a lower leg injury. MR personnel responded and assisted National Ambulance Service (NAS) personnel at the scene. MR and NAS personnel stretchered the walker to a waiting ambulance for transfer to hospital. The incident was stood down at 18:02. We’d like to thank the NAS for their assistance. In an exceptionally busy day, Saturday, October 20th, saw the Glen of Imaal Red Cross Mountain Rescue Team and the Dublin & Wicklow Mountain Rescue Team tasked to four separate incidents in Dublin and Wicklow. Three taskings came from An Garda Síochána, and one from Ambulance Control. The four incidents, which were geographically diverse and simultaneous, stretched the teams’ resources but showed the value of inter-agency cooperation. The first tasking came at 11:20 to assist a hillwalker who had collapsed in Fraughan Rock Glen while climbing Lugnaquilla. MR personnel responded to the incident site, and following assessment, accompanied the patient from the hill on foot. The incident was stood down at 13:43. The second callout of the day came at 12:05 to assist the National Ambulance Service (NAS) with an incident in Ticknock. A NAS ambulance crew requested mountain rescue (MR) assistance when responding to an injured mountain biker. MR personnel responded to assist, with an MR doctor helping to treat the biker for a number of injuries. The patient was airlifted by Rescue 116 at 15:30 and the incident was stood down at 16:01. The teams were tasked again at 12:12 to assist a climber in Glendalough. The climber, who fell approximately 30 metres, was assessed and treated by MR medics and airlifted by Rescue 116. The incident was stood down at 13:40. The fourth callout, at 13:19, was a request to assist a paraglider who sustained multiple injuries on the Great Sugar Loaf. The paraglider was attended by MR personnel, working alongside Wicklow Rapid Response and the winchman from Rescue 117, before being airlifted to hospital. The incident was stood down at 15:04. While days like this one are rare, they show how important cooperation between voluntary and statutory emergency services is. Mountain Rescue would like to thank all agencies involved including: Kilmacanogue Community First Responders, who had a member first on scene on the Sugarloaf, Wicklow Rapid Response, Rescue 116, Rescue 117, National Ambulance Service, and An Garda Síochána for their assistance. 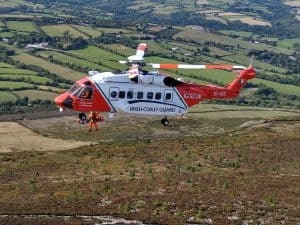 At 15:34hrs on Sunday, October 14th, The Glen of Imaal Red Cross Mountain Rescue Team and the Dublin Wicklow Mountain Rescue Team were tasked by An Garda Siochana to come to the aid of a woman who had fallen and suffered a lower leg injury. The woman was part of a hill walking group and was out with them when the incident occurred. After being assessed and treated by MR Medics she was airlifted by Rescue 116 to Dublin Airport where she was collected by Ambulance and transported to Hospital for further care. At 19:51 on Wednesday, October 3rd, The Glen of Imaal Mountain Rescue Team and Dublin & Wicklow Mountain Rescue Team were tasked by An Garda Síochána to assist Wicklow Fire Service at an incident on the Great Sugar Loaf. Mountain rescue (MR) were tasked when a group of walkers became stranded on the hill by a gorse fire. MR personnel responded to assist the walkers, while the fire service extinguished the fire. The incident was stood down at 20:14, with all of the walkers safely back at the car park. Thanks to Wicklow Fire Service for their assistance. 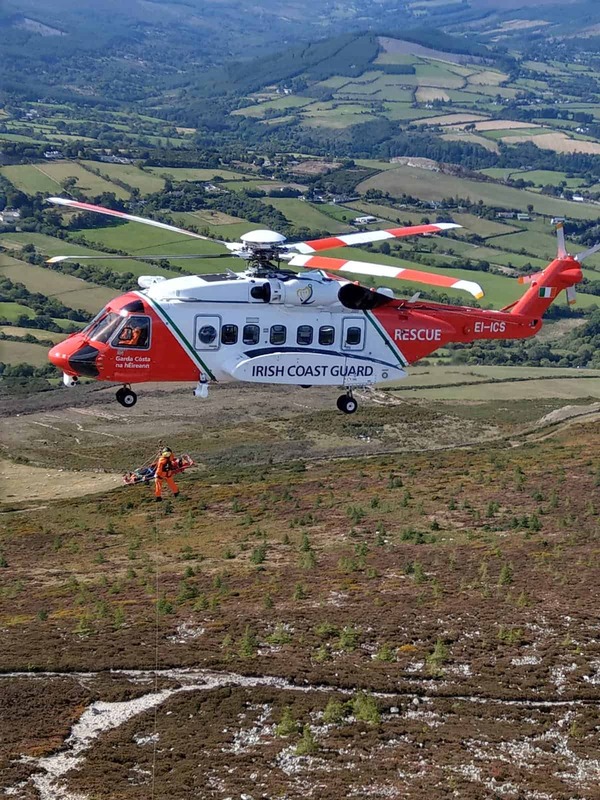 AT 16:07hrs on Saturday, September 22nd The Glen of Imaal Mountain Rescue Team and Dublin & Wicklow Mountain Rescue Team were tasked by An Garda Síochána to assist a hillwalker who had sustained a leg injury. The woman had sustained an injury to her knee while descending from Lugnaquilla. The party’s position was confirmed using Sarloc Technology and Mountain Rescue (MR) parties were dispatched to their location. The woman’s injuries were assessed by an MR medic. She was packaged and stretchered to a MR vehicle which transferred her to an ambulance. The incident was stood down at 18:26hrs. At 14:35hrs on Tuesday, September 18th The Glen of Imaal Mountain Rescue Team and Dublin & Wicklow Mountain Rescue Team were tasked by An Garda Síochána to assist the National Ambulance Service (NAS) with an incident on the Wicklow Way near Lough Tay. Mountain Rescue (MR) assistance was requested to help a NAS crew to access and evacuate a walker on the Wicklow Way. An MR medic assisted a NAS advanced paramedic to treat the walker, who had sustained a head injury after a fall. The patient was then packaged into a stretcher by MR personnel and evacuated to a waiting ambulance. The incident was stood down at 15:50hrs. We’d like to thank the NAS crew for their assistance.